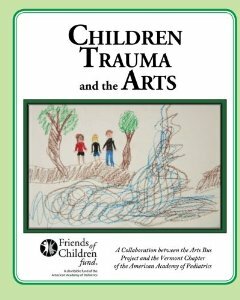 In 2013, in partnership with the Vermont Chapter of the American Academy of Pediatrics, and with support from the national AAP, The Arts Bus Project has published a book on children, trauma and the arts and has been distributed to pediatricians, family practitioners, psychiatrists, psychologists, educators, arts leaders, and disaster relief coordinators in the state. The book makes clear how important, and how uniquely effective, the arts can be in responding to the need children have to express themselves and find a creative healing path when they’re hit with an experience like Irene. Vermont Public Radio (VPR) invited Arts Bus director Cynthia Sandusky to discuss Children, Trauma and the Arts, as part of their 2-year anniversary coverage of Tropical Storm Irene. Follow this link and hear the entire interview: http://digital.vpr.net/post/group-helps-kids-overcome-trauma-through-arts.